Pacific trade winds accompanied ancient Polynesians, 19th century whaling ships and, in 1940, the first Pan Am Flying Boats to the mid-ocean destination of the Hawaiian Islands. These same moisture-laden northeasterly trades give Hawaii’s windward slopes the tropical lushness we envision. As beautiful as the “wet” sides of the islands are, visitors seek more reliably sunny conditions for tanning and swimming and they crowd the coasts of the “dry” sides. On Maui, the archipelago’s second largest and second most populated island, we head for Napili Kai Beach Resort on the divide between “wet” and “dry”. Driving up the west coast from Lahaina, hills of yellow grasses turn vibrant green and scrubby casuarinas give way to dark towering Norfolk Pines. Napili Bay looks like our ideal of a tropical beach; a palm-fringed crescent of golden sand hugging an intimate bay with aquarium-like snorkeling. Each day we walk a 2.5 mile coastal trail over lava-formed cliffs past neighboring Kapalua with its intensely manicured grounds. 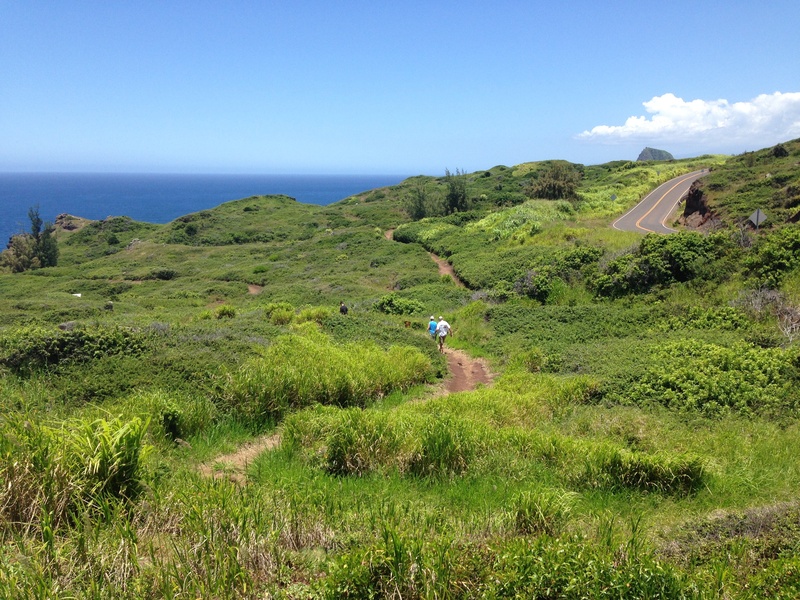 Just beyond Kapalua lies the wild and ruggedly picturesque north side and one of the most scenic drives on the island. We follow State Highway 30 northwest toward the secluded hamlet of Kahakuloa, 15 miles away around the northern tip of Maui. A few minutes beyond Kapalua, clusters of parked cars pinpoint Mokuleia and Honolua Bays, known for their exceptional snorkeling. The road takes a steep climb up deep rust-colored cliffs that plunge hundreds of feet to the cobalt sea. There is an occasional rustic local homestead but nothing else to interrupt the feeling of solitude. 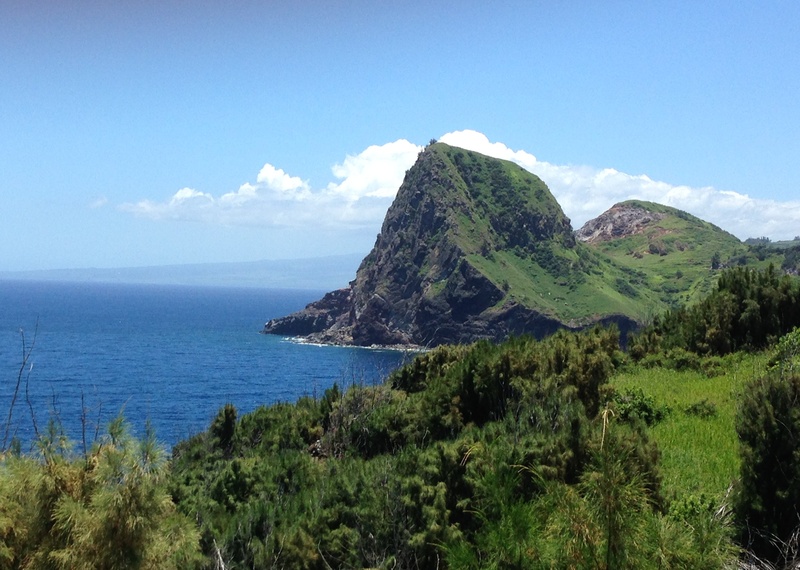 We pull over at Papanalahoa Point to view the coastline and the island of Moloka’i eight miles across the straights. From here you can hike the 1.5 mile Ohai Trail along grassy bluffs. From the back of his pick-up a local man uses a machete to open a young coconut without spilling a drop of the water it holds. He claims the delicately flavored coconut water brims with cleansing properties, electrolytes and was used straight from the nut as wartime I.V.s. 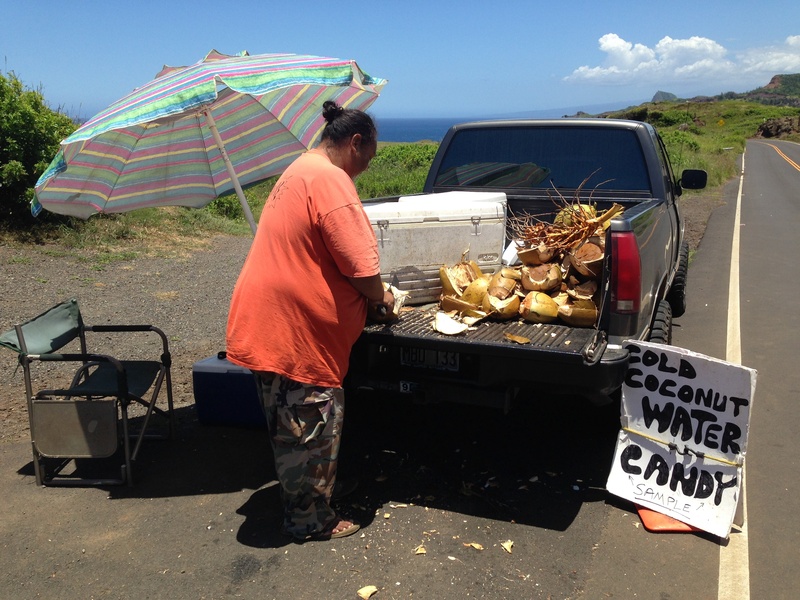 The divided two-lane state highway stops abruptly 2 miles short of Kahakuloa. Barely one car wide, the road corkscrews around blind curves on sheer cliffs. No guardrails. Few pullouts. We start down and within half a minute we encounter 3 cars coming up and find ourselves backing uphill to a half-vehicle-wide pullout. They edge by and we press on. In a few hundred yards we are forced into another hair-raising maneuver, our side view mirror gently nudging that of another car as he squeezes against a cliff to allow us to pass. Later we learn that this stretch has recently been “improved”, it was unpaved until a few months ago. Ahead more cars are inching our way. “Another day perhaps…early in the morning and not on a weekend” we tell ourselves and turn the car around in favor of the relaxing and beautiful drive back to Napili.